A review of the literature on diet and hyperactivity [more correctly termed Attention Deficit Hyperactivity Disorder – ADHD] showed that dietary factors do not cause hyperactivity, so additives do not need to be banned. But they do effect some children. The suspect diet substances being investigated have broadened, as have the problems diet affects. There is individual variation in presenting problem profiles, in symptoms that change, in amount of change, and in suspect chemicals not tolerated. Relevant issues are the dose of suspect chemicals and the age and susceptibility of each child. A series of clinical studies were carried out over several years to investigate this relationship and report findings. In the first study of 516 families parents reported that improvement occurred in behaviour, social, learning, activity and sleep problems, as well as in physical symptoms generally termed “allergic”. Suspect diet substances and smells are better thought of as aggravating the underlying predisposition in susceptible children. The more detailed second study of 112 children has shown dietary treatment to be clinically useful, and to produce demonstrable statistically significant change. Improvement was significant on the simple t-test evaluation of the change in the average RBRI scores; this significance was confirmed statistically with complex multivariat analysis of the behavioural profiles of the different responder groups. Almost 70% of parents reported benefit using the LAALS Diet. While the core features of ADHD [poor concentration, impulsivity and activity] were reported as improving, the most striking diet change, was in mood, with irritability improving more than any of those. It is suggested that these food sensitive children are better described as hyper-reactive than hyperactive, reacting to many aspects of the environment, with the food components aggravating this. An evaluation of the diet itself was made. The food substances and environmental factors which should be excluded were assessed. At different levels of strictness these exclusions form the initial screening Elimination diets to investigate food intolerance in children. In addition, variation requiring reduction or exclusion of foods commonly implicated in allergy has to be incorporated, after family diet history. In 1974 Feingold recommended a diet as the global treatment for hyperactivity. By 1994 dietary treatment has developed into a process better named Dietary investigation and management of food intolerance in children. 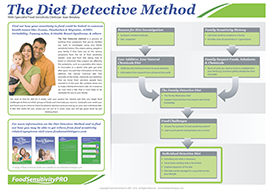 Families begin management with a screening diet to investigate whether food intolerance is present; conduct challenges, and if there is a diet effect, use single food challenges to progress to an Individual food intolerance diet. The various diets and instructions for single food challenges are provided. Clinical research is a useful way of investigating the many factors involved in this complex area of study. The observations presented have provided a position which allows a broader understanding of the issues occurring in the clinical situation. Guidelines for further research are presented. The full thesis is available from this site as a bonus with the professional set or alone as one of the books. I like reading through a pkst thjat will make mmen and women think. Also, thanks ffor permittiing me to comment! hottest updates, therefore where can i do it please help out. That is an extremely well written article. I will make sure to bookmark it and return to read extra of your helpful info. Fabulous, what a website it is! This website gives helpful facts to us, keep it up.